Blossom Diva is a child theme of Blossom Feminine free WordPress theme for aspiring female bloggers! 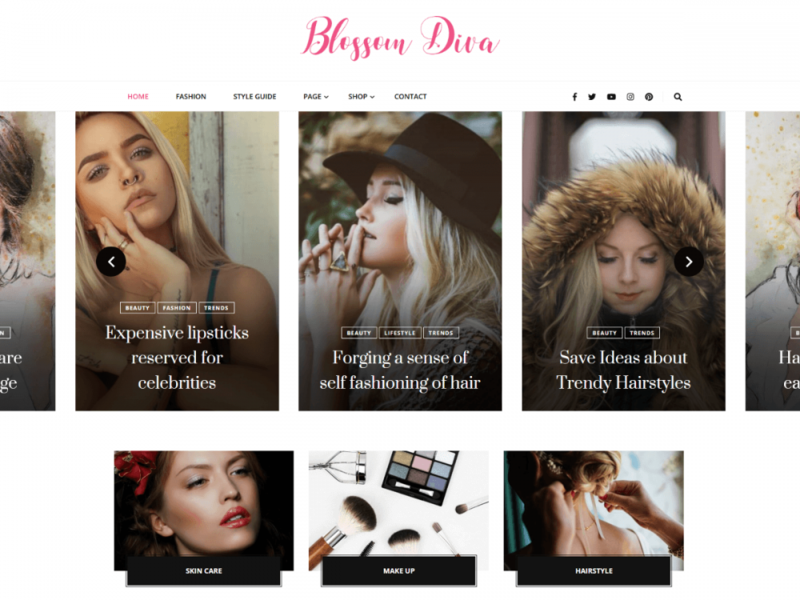 Blossom Diva is an elegant and beautiful free WordPress theme for female bloggers to help them create a visually appealing and stunning blog without writing a single line of code. This theme features an attractive modern layout to increase user engagement on your website. Furthermore, the theme comes with advanced features and easy customization option to help you create a premium looking feminine blog. Fashion Blog – Write about the latest fashion trends and tips for other ladies out there. Lifestyle Blog – Share your experiences and give tips and advice to girls about living a successful life. Journal Blog – Share your random musings and girly things with the world with this easy to use a feminine blog. Travel Blog – Travel and write about your trips. Beauty Blog – Write beauty and makeup tutorials and share them with the world. Mom Blog – Share the experience of being a mom with other moms. Food Blog – Got an amazing cookery skill and recipes? Share them with other food lovers! You want to create a gorgeous feminine blog for free! You are using WordPress to create your blog. You don’t want to write a single line of code to create your blog. You want an easy to use WordPress template for your blog. You want to share your ideas and experiences with the world with an elegant looking blog. You want to start your career as a professional blogger and want an amazing blog design theme to start with. You want an easily customizable WordPress template for your blog. You want a top quality design for your blog, but hiring a developer will break your bank. Your client wants a super-fast blog with modern layouts and clutter-free design. The number of people who surf the Internet on mobile phones has increased exponentially– according to stats, more than 50% of Google searches are done on phones. So, your website must be responsive to screen sizes. Also, Google boosts the ranking of websites that are mobile friendly. With Blossom Diva, your blog will display beautifully, without breaking, on each and every device. The theme adjusts itself to the screen size so that your visitors can get a smooth user experience and Google can rank you higher. Furthermore, Blossom Diva passes Google’s mobile-friendly test. You can select from 2 header layouts to give your blog a unique and attractive look and keep your visitors engaged on your website. You can display the list of your latest posts either with a rectangular featured image or square featured image. Blossom Diva Free WordPress theme allows you to choose from two home page layouts. Blossom Diva Free WordPress theme has two unique slider layouts that you can use to display your best articles. With Blossom Diva free theme, you can display your posts and pages in three layouts– full width, full-width with centered, left-sidebar, or right-sidebar. Search engines love websites made using the Blossom Diva Free WordPress theme. We have put our expert SEO team’s knowledge and expertise into the development of the theme in such a way that search engines can easily find your website and rank it above your competitors on the search results page. The theme will give you an edge to help you outrank your competitors. We know that Google and users prefer a fast website, so we made Blossom Diva in such a way that your visitors will not experience any lag. Studies also show that even a second makes a difference when it comes to loading speed. Customers move to another website if they have to wait, so speed matters. With Blossom Diva, you can rest assure on the performance of your website. Blossom Diva rocks with an attractive slider on the banner section. You can choose from 2 different slider layout to display up to 20 latest posts or 20 posts from a particular category. You can highlight your content below the banner slider using the featured area section. This section will help you increase user-engagement on your website. We have chosen the fonts on Blossom Diva for better readability, but you might have other fonts on your mind. You can easily change the primary and secondary font and font size as per your taste. Show your bio on your blog to build a strong relationship with your audience. You can easily add your photo along with a short description, your signature, and your social media profiles on the sidebar using Blossom Author Bio widget. Blossom Diva Free WordPress theme allows you to display your social media links on your website so that your visitors can find you on social media. Social media on your website will also help you boost your business’ engagement. The theme also supports Russian and Chinese social media like OK, VK, Zing, QQ, and others. You can add unlimited social media on your website. The theme is WooCommerce compatible which helps you to easily create an online shop. Earn good money by promoting your own fashion line through Blossom Diva online shop section. You can place your Fashion Products in the theme’s online shop section on the homepage as well as in the footer. You can also create a separate shop page to showcase and promote your products. Have a fabulous Instagram page to showcase? Now easily integrate your Instagram to your website with Blossom Diva Free WordPress theme. Flaunt your social presence! Blossom Diva Free theme has widgets for all your favorite social media accounts. You can place your favorite accounts Instagram, SnapChat, Twitter, Facebook, and/or Pinterest profile on the sidebar! Grow your email subscribers with the perfect combination of Blossom Diva Free theme’s newsletter section and the BlossomThemes Email Newsletter plugin, which will allow you to easily add subscribers and engage with them. Blossom Diva has an option that allows you to show the last updated date on the single post page. This feature will help you rank better in Google as Google prefers to rank recently updated posts. Blossom Diva theme comes with easy to use built-in live customizer to help you customize your website with a live preview. You can make changes to your website and see its preview without saving it using the live customizer. You can build your dream website within no time using the live theme panel. Schema ready code is cherry on the top for the SEO of your blog. A simple schema integration on Blossom Diva will help you beat your competitors on search results. Blossom Diva free WordPress theme has ample space for widgets. You can add and manage the widgets you require without compromising the design of the theme. Widget ready design and code allow you to customize your website as you desire easily. Blossom Diva free theme is cross-browser compatible, which means the theme will work seamlessly with the popular web browsers. The theme is tested on Chrome, Firefox, Edge, and Safari. Your users can view your beautiful website using any web browser without any issue. You don’t have to worry about any future theme updates as Blossom Diva free WordPress theme comes with a one-click update button for stress-free updates. This theme allows you easily add or edit the footer credit on your website pages. Scroll to Top is a button on the right lower corner of the screen and when clicked takes you to the top of the webpage with a single click. With the perfect font type, size, spaces, and contrast, Blossom Diva free WordPress theme makes sure that your content is easy on the eye and your visitors enjoy reading what you have to say. Don’t let the language barrier come between you and your dream of starting your own food blog. Blossom Diva theme supports localization so that you can use the theme in your local language. Do you use right-to-left (RTL) scripts like Arabic? Well, worry not! Blossom Diva free WordPress theme supports both LTR and RTL languages. You can write your content with confidence in your own language! You can easily add your own logo on your website using the Blossom Diva free theme. Want to modify some CSS effects or the change color of a section? Blossom Diva free theme allows you to easily add CSS effects right from the customizer using custom CSS codes. Customization and editing the theme is very easy as the theme was built on clean, well organized, and commented code. Blossom Diva free WordPress theme comes with extensive theme documentation to help you set up your website. Just follow the step by step guidelines on the documentation and your website will be ready in no time.